Want to know how to build a wooden swing set in the backyard for the kids? Take matters into your hands and create your own wooden swing set with your own craftsman skills. This step by step tutorial and video will show you how. This is how you can build a classic A-frame swing set with two seats. This is a beautiful handmade approach to the project. A great project for homesteader’s who have kids or grandkids, and want to give them a one-of-a-kind handmade swing set to play on, handcrafted with love and care. By the way, the image above is a joke, it takes a very skilled crafter to build a swing set that detailed! In this tutorial we’ll be making the swing set pictured here via The Brad Next Door on Youtube. This crafter built his swing set out of reclaimed timber. Look around your homestead, and your neighborhood, and see if there’s any quality wood that you could repurpose for your own swing set. Cedar makes a great durable option. Take a shortcut and get this A-frame joint to skip a few steps and DIY the whole swing set with ease. Measure the space between the two legs. Cross the legs at the top. Mark where the legs meet. Cut the sides of the marking and use a chisel to remove the wood between your markings. Chisel half way down. You are creating a joint. Attach the joints together so the legs now rest flush with one another. You may need to force them into place with another piece of wood being used as a hammer. Not Pictured – Attach the 2×2 wood at the base of both sides of legs as a brace. You can nail it in place or create a hole for the beam to go into the legs. Put on top beam, and mark the area where you need to cut off. Chisel. This gives you a precise joint for a snug fit. Add holes for the ropes which you will add later. Space them out evenly. At this point you may want to stain the wood. Step 4. Attach the swing. Attach the rope and make sure that the knot is secured. You can also put initials of your kids names in the wood to personalize it. Images and tutorial via The Brad Next Door on Youtube. Too complicated? Opt for a tree swing! All you need is a sturdy tree branch, rope, and wood. Buy a pre-made tree swing here. 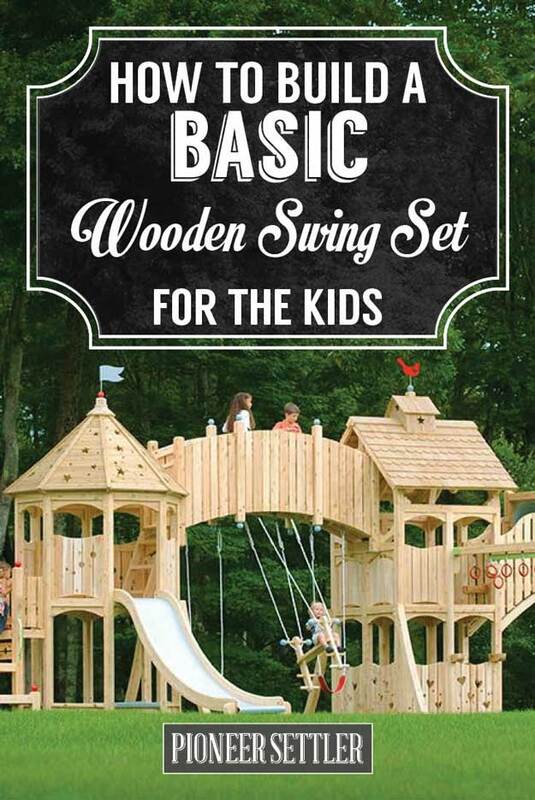 Are you going to make this wooden swing set for the kids? Let us know below in the comments!